It’s so close guys! 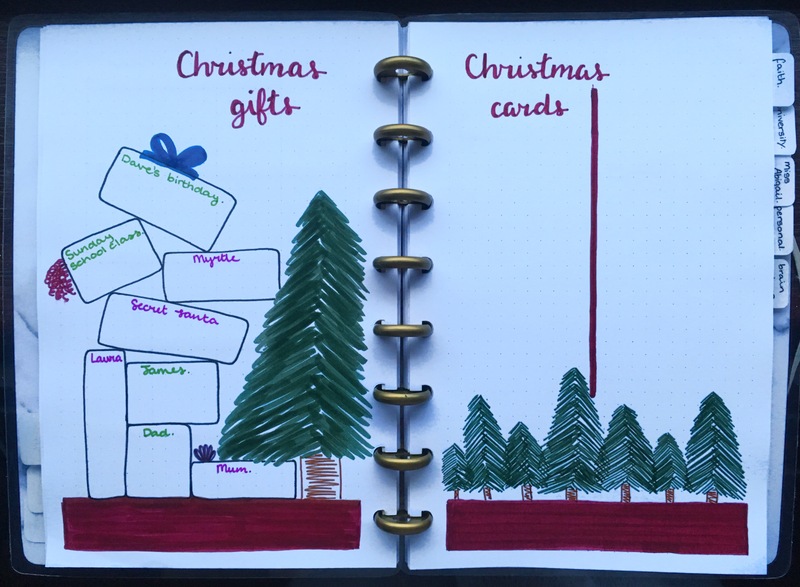 December is nearly here and bringing with it Christmas, snow and deadlines – so you can imagine why my December monthly planning was pretty important. This is actually the most innovative plan with me I’ve ever posted, most of my months follow a similar pattern and so end up having the same spreads… but not December, it dances to its own tune (a tune that was definitely covered by Michael Buble at some point). I kept the theme pretty simple, the great thing about winter months is that blank space looks like snow and thus becomes a feature, rather than looking sparse. I also didn’t create a sticker pack for this month as this theme is so simple even a monkey could do it, so if you’re considering starting a bullet journal there’s no better way to start! I could ramble on all day, so let’s just get into everything! I started the month, as always, with a title page. Since I’m going for a fairly minimal theme this month I started with these cute little Christmas tree’s to create a forest at the bottom of the page. For the trees, to make it a bit easier on myself, I drew out a triangle in pencil first to give myself an idea of shape, and then filled them in using the felt tip end of my Tombow Dual Brush Pen in 249. The title font is also a little different than other months, I based this font on one I found online, but I can’t for the life of me remember where I got it – sorry! To fill out a little bit of the top space I added a simple calendar which allowed me to bring in my secondary colour of the month with this beautiful Burgundy-red Tombow (number 837). Even though it’s simple, it’s probably one of my favourite title pages ever! 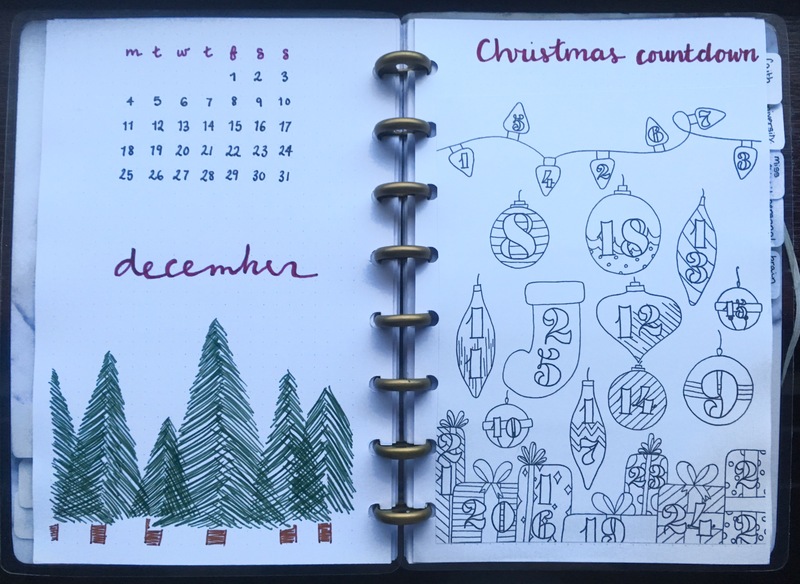 Beside my title page, I put one of my Christmas Countdown calendars (which is available on my Etsy store)… I can’t wait to see it all coloured in! December is a crazy month – I only have uni for the first two weeks, then I’m working the third week and taking the last week off everything, so my traditional monthly log just wasn’t going to cut the mustard this month. Instead, I went for a more traditional layout (this is actually the same general calendar you’ll see it My Blog and Business Planning). 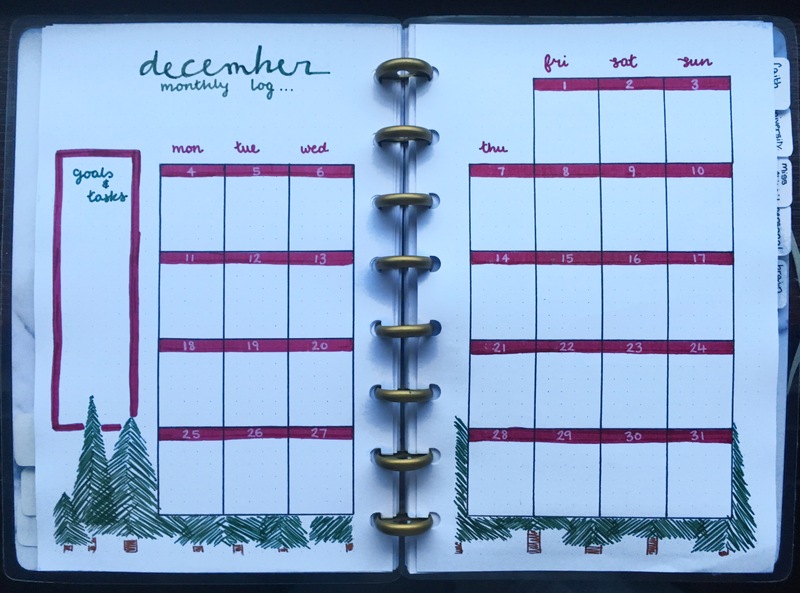 For decoration, I used my burgundy tombow to highlight the dates and that same green tree design as I used in my title page. This is my favourite spread of the whole month, I’m in love! Since it’s December, I have a lot of things to remember, least of all presents and cards to get. I created these two spreads so I can stay on track this year, but also to simplify my life next year when I come to make my card list etc. I kept this relatively simple, the idea being that I can colour in the present when it’s bought and simply list all the people I need to give cards to. I could’ve gone more extra, but I thought this was sufficiently Christmassy without being over the top! Since it’s the last month of the year, there are a few things I’d like to get done before 2018 hits, and this is where I’m going to jot them down. There’s nothing special or important, just a few things I have to try and remember to focus on. That way, when January 1st rolls around, I’ll be ready and raring to go! And that’s it, I kept it pretty simple this month – it’s going to be a busy one so I needed spreads that are going to be unbelievably easy to maintain. I really hope you guys liked this simple set up, and hey, why not start your own bullet journal for the new year? You know you want to! Let me know in the comments which spread was your favourite, I’m most in love with the monthlies, but it’s a close race! Love your Christmas Countdown page! I ended up modifying my calendar pages to be more like yours and it’s working great so far. Another thing I’m experimenting with is printing out things (or ripping pages from magazines) and taping them in my journal. My daily journal is all about function over form, but taping a few pages in has been saving some time and making it a little prettier. This just made me think of all the things I have to do for the holidays! It never ends. Gorgeous!! 😍 I love your Christmas countdown page! Thanks Shanah, it took for ever to draw, but I’m really happy with how it turned out – can’t wait to get colouring!